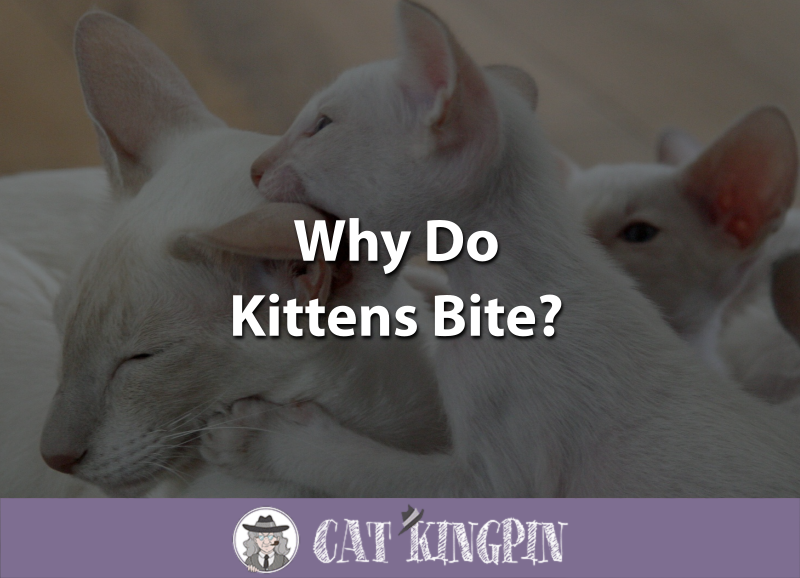 » Why Do Kittens Bite? Anyone who has ever owned a kitten knows this to be true: kittens bite. A lot. While their teeth are incredibly small they are also very sharp! And don’t count out their claws! Kittens will bite pretty much everything and everyone (including you! ), but why do kittens bite? Kittens bite for a variety of reasons, most of which are benign. In fact, your kitten is almost always playing when they bite you. While it can be an annoying part of kittenhood, understanding why your kitten bites you (and everything else) can be very helpful when managing the behavior. Why Do Kittens Bite Your Fingers? Why Do Kittens Bite When You Pet Them? Why Do Kittens Bite then Lick You? Why Do Kittens Bite Toes? Why Do Kittens Bite Your Face? Why Do Kittens Bite Your Nose? Why Do Kittens Bite Each Other? How Much Do Kittens Bite? When Will Kittens Stop Biting? Kittens are new to the world and are extremely curious about everything. Just like human babies, kittens use their mouths to explore the world around them. Whether it’s by tasting, licking, or biting, a kitten’s first instinct will be to put something in their mouth. Most of the time when your kitten bites you it is because they are trying to play. Among themselves, kittens will bite, scratch, tackle, and jump on one another while playing. Your kitten is simply used to this behavior with his littermates and is giving it a shot with you as well! Other times, kittens bite because they are angry or afraid. If your kitten is biting you and exhibiting other signs of anxiety or aggression, such as growling or hissing, you should take them to the veterinarian to rule out any physical issues that may be contributing to their behavior. Kittens will bite your fingers for the same reason they’ll bite any other part of your body – because they can! Kittens explore the world with their mouths and will bite on your fingers either because they are curious or because they are playing. It is very rare for kittens to bite out of aggression if they are unprovoked. Don’t let your kitten play with your hands! It can be hard to convince a kitten not to bite during play. If your kitten is biting your hands too much, try playing with your kitten using cat toys instead. The less they associate your fingers with playing, the less they will bite you. Tell your kitten “no” in a deep and authoritative voice. Then ignore them. If your kitten learns that biting your hands quickly brings the game to an end, they may be less likely to bite in the future. Say “ouch” sharply in a high pitched voice and then slowly move your fingers away. If you jerk your fingers away from your kitten, they will likely think it’s a game and try to bite you more. Saying “ouch” mimics the noise that your kitten’s littermates would make in order to communicate that they are being hurt. Make sure your kitten has toys to play with. One of the best types of toys for kittens is a “teaser” toy, such as the Bascolor Retractable Cat Toy. It has plenty of feathers that your kitten will find irresistible, and it will save your fingers from sharp kitten teeth! If all else fails, try and remember that most kittens grow out of the habit of biting your fingers! Most of the time, kittens bite when you pet them because they are playing. Kittens love to use their mouths when they play with one another, so they mimic that same behavior when they play with their human friends. On rare occasions, however, your kitten may be biting because they are afraid. This is especially true during the first few weeks when your kitten is home. It may take a little while for your kitten to trust you, and if you try and pet them when they aren’t ready for it they may bite in order to protect themselves. If your kitten is angry or afraid, they will give you clues before they bite you. They may hiss, try and run and hide, or even growl. If your kitten doesn’t display any of these signs, it’s likely they are simply trying to play with you. Try petting your kitten when they’re tired out! They are more likely to snuggle with you once they’ve burned off all that kitten energy. A good way to tire out a kitten is by using a pet-safe laser toy. Kittens will chase that little red dot for hours and it involves very little effort on your part! This is one of the most unusual kitten behaviors that owners contend with. Kittens will often bite you and then immediately begin licking. What gives? Well, it could be one of two things. Sometimes kittens give little “love bites” which are simply expressions of their affection. Love bites aren’t as vigorous as play biting and are often followed by a quick lick or two. If your kitten is doing this, take it as a compliment! On the other hand, your kitten may be trying to groom you. Mother cats often nibble and lick their kittens in order to groom them, and your kitten may be replicating this behavior with you. If you don’t like it, you can simply say “no” or “ouch” and then remove yourself from the situation. Once your kitten gets the message that you don’t appreciate this cleaning service, they will likely give up. Toes can be absolutely irresistible to kittens! We’ve all been there. You enter your room looking for your kitten, only to have them run out from where they’ve been hiding and ambush your toes. Kittens bite toes because toes move, they are small, and they are at the kitten’s eye level. In almost all circumstances, your kitten is biting your toes because they are playing with you. If you bring your kitten up to your face to give them a kiss, you’re likely to get bit. But don’t worry; it’s not because your kitten is angry. In fact, most of the time when kittens bite it’s because they are playing! If you don’t want to be bitten on the face, your best course of action is not to give your kitten access to your face. It can be hard to convince tiny kittens who explore everything with their mouths and are always ready to play not to bite. Your nose is the part of your face that protrudes the most, which makes it perfect for kitten bites. Because kittens bite mostly out of play, if you bring your kitten to your face it’s quite possible that you’ll be rewarded with a swift bite on the nose. While it may hurt, it’s important to keep this behavior in perspective. Kittens play by biting, tackling, and scratching, all of which mimic what they do with their littermates. These are also skills they would need as adults for hunting in the wild. If you don’t want your kitten to bite your nose it’s best to keep your nose away from your kitten until they’ve matured a bit. Kittens bite their littermates all the time. Most of the time they do so because they are playing. Kittens play with one another in a very purposeful way. Far from just roughhousing, the biting that occurs during their games is practice for hunting and survival in adulthood. Kittens will instinctively play fight with one another as soon as they are physically able to do so. If you see your kitten biting another kitten, don’t worry too much. Only rarely do kitten play fights require human intervention. Kittens communicate with one another very well, and if one kitten is biting too hard the other kitten will let them know! Anyone who has ever had a kitten knows the answer to this question: most kittens bite a lot. It may seem impossible to play with your kitten without getting bitten, and for the first months of your kitten’s life this is often the case. Kittens need to be taught that their human being doesn’t want to play in the same way their littermates would. Telling them no, removing yourself from the game, and offering them plenty of toys can all curb biting. Here’s a video of a cute kitten that does a lot of biting! While you can train your kitten not to bite when they are very young, some kittens will continue to bite until they are a year or so old. Kittens reach emotional adulthood once they turn two, and will sometimes bite until they are mature enough to control themselves. So, why do kittens bite? Kittens explore the world with their mouths. Kittens also engage in play fighting with their littermates. Play fighting often involves biting and scratching, and kittens will often try to play in the same manner with the human friends as they do with their littermates. If you don’t like being bit (and let’s face it, most people don’t), you can try purchasing a variety of stimulating kitten toys to keep your kitten engaged and away from your fingers, toes, nose, and hands. The Bascolor Retractable Cat Toy is a great choice because the dangling feathers are irresistible to kittens. Offering your kitten plenty of toys and scolding them when they bite you are great ways to curb this behavior. And remember, most kittens will grow out of it!